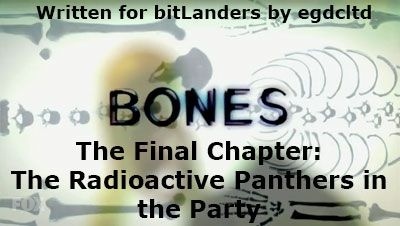 "The Final Chapter: The Radioactive Panthers in the Party" is episode ten of season twelve of Bones, the forensic drama television series loosely based on the novels and life of anthropologist Kathy Reichs. In this episode, a mattress king turned wannabe director is found dead. A man is driving and talking on the phone at the same time. He is saying to the person at the other end that ten hours are down and there are only three more to go. And he's got this. The man on the other end tells him to pull over and get some sleep because he sounds crazy. The driver, Gordy, says that what's crazy is letting the woman he loves move to New York. 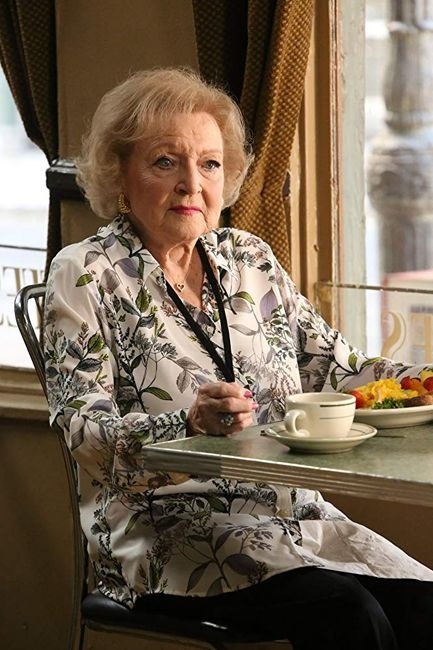 His friend says that, from what he's heard, Betty is doing extremely well. And it's been four years. Gordy replies that he can't stop thinking about her; his friend says they only dated for a month and if Gordy turns up on her doorstep he'll look crazy. Frankly, if he does that, crazy will be some way behind him in the rear view mirror. Gordy replies that what's crazy is letting the woman he loves move to New York. Again. So his friend again tells him to pull over and get some sleep. Gordy isn't going to do it, then he drives under a bridge and a body falls from it and crashes through his windscreen. Gordy, perhaps because of the lack of sleep, drives very erratically. Admittedly a body falling onto your car is a shock, but the way he reacted did not make sense. Then Gordy crashes the car into a tree. He gets out of it as the car catches fire and tells the person on the phone to call his mother and tell her he just crashed her car. The body was in relatively decent shape when it hit the car. Now it's going to be extra-crispy. Ah, come on, Bones, it's too early for math. Too early. Brennan is telling Booth that a man jumped 30 feet off an overpass. He remarks that would leave a dent. So Brennan starts calculating how big a dent it would make. Booth tells her it's too early for maths. Brennan doesn't think it's ever too early for maths. 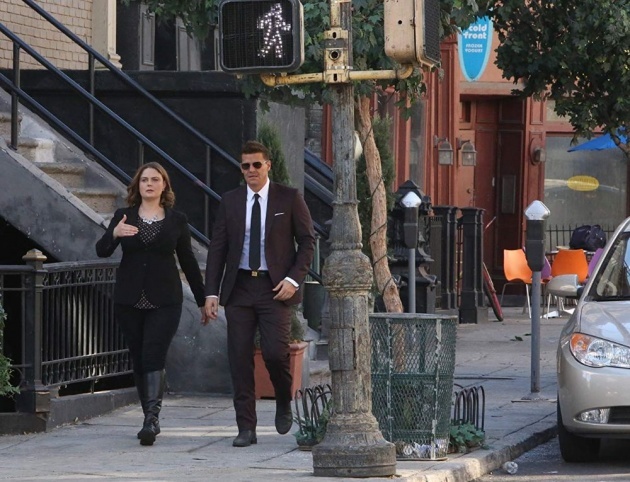 Booth replies that before 12 is too early; after is too late. Which Brennan points out would leave no time for maths. Which was Booth's point. Hulk Bones for a Dissertation Topic? Oh, okay. How about "Hulk-Bones: a Study on the Skeleton Effects of Incredible Physical Strength"? 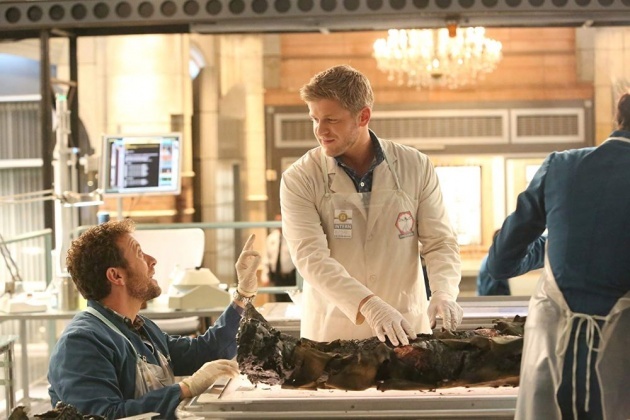 At the Jeffersonian, Hodgins is suggesting that Wendell Bray write about Hulk bones. Wendell points out that to write about Hulk bones, he would need the Hulk, and the Hulk is fictional. The subject in question is the topic for Wendell's dissertation paper. Hodgins says that the dissertation committee will eat it up, as it shows that Wendell can think outside the box. Cam injects a note of sanity by suggesting the committee would think that Wendell has completely lost his mind. Brennan arrives at this point and Wendell tells her the victim was a Caucasian male. It's said that if the victim wanted to kill himself, he did a good job. Then Brennan says he didn't - want to kill himself that is. The fractures on the skull are dry breaks, showing the victim was dead before he fell. The victim was in his mid to late forties and a heavy smoker according to Wendell. Who then mentions the prolonged effect of nicotine on the long bones. No, the coccyx. He explains to Brennan that he's trying to come up with a title for his dissertation paper. Brennan tells him to choose wisely, as it will be one of the most important decisions of his professional career. Wendell thanks her, commenting that it wasn't as if he wasn't already stressing enough. Brennan asks Wendell what excites him about anthropology and he mentions the title of her dissertation paper. Brennan agrees it was an exceptional paper. As were the other four. When Wendell asks if Brennan wrote five dissertation papers she says yes. She was curious about a variety of subjects and wasn't sure what to focus on. So she wrote all five. Wendell replies that that is a lot of work and Brennan agrees yes, saying that's the point. She then asks if Wendell has noticed anything odd about the victim's teeth. Wendell replies they had crowns and Brennan asks him to remove one. The teeth show the victim suffered from malignant infantile osteopetrosis, as child. A very rare disease, according to Wendell. Listen, Aubrey, if you have to ask if you are my boss, you're not my boss. Aubrey arrives in Booth's office and tells him that the victim was Ronald Bergman, the mattress king of south east Baltimore. Booth thinks this sounds like a case for Aubrey. 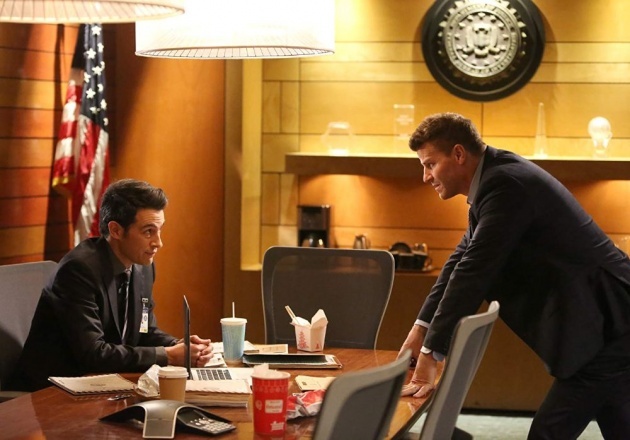 Aubrey asks if Booth is giving him the lead on the case and Booth tells Aubrey that if he wants to become a supervisory special agent, he needs some ASA experience under his belt. Aubrey asks if that means he's Booth's boss; Booth replies that if you have to ask, you aren't. Hodgins and Angela are watching one of Bergman's ads. Angela says that he seems so sweet and obviously cared about what he was doing. Hodgins replies that he's never seen Angela got so emotional over a commercial. Angela just thinks it's nice in this world of snark. Then Cam arrives with Bergman's cellphone. Which is worse for wear. And melted to his leg. Part of which is still attached to it. Aubrey has brought in the manager of Slumberland, Linda Martin. She says she's busy and doesn't have the time, as they have a giant sale coming up. And asks Aubrey what her idiot ex has done this time. Aubrey tells her it's not about her ex, but about her boss. He's dead. Linda says she knew it was a mistake. Her boss was a creative guy and filled with wild ideas. After all those years directing Slumberland commercials, Bergman believed he was ready for the real thing. Directing a real film. He could be the next Gordon Welles. Aubrey asks if she means Orson; Linda is not into that sort of thing. Apparently Bergman wrote a script and took a leave of absence, then went off to make his movie. He thought it would be his Citizen Crane. Geez, Hodgins! You cannot just roll up on me like that! 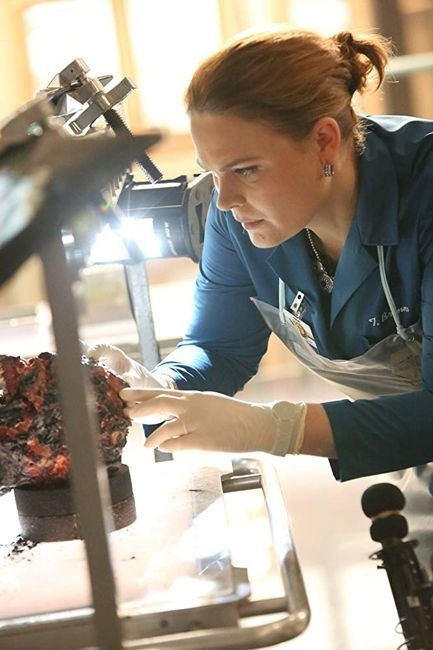 Cam is examining the remains when Hodgins arrives and scares the life out of her. She tells Hodgins he can't just wheel up on people like that. 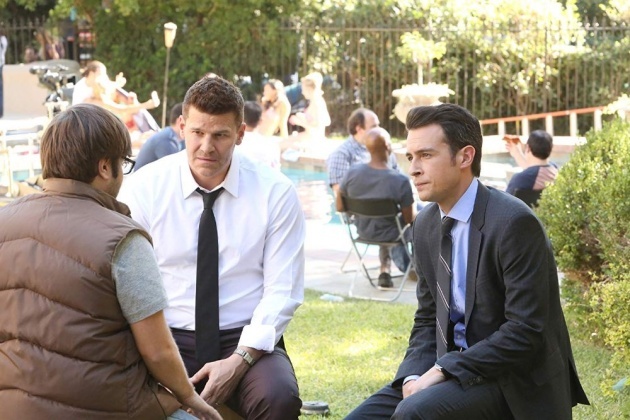 Hodgins replies he's in a wheelchair; he has no choice but to wheel up on people. 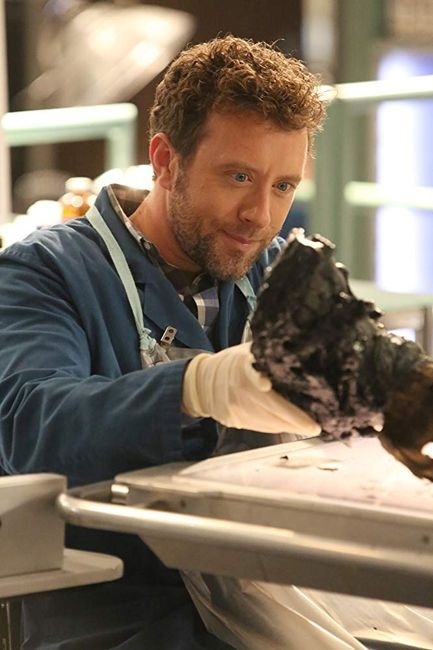 Hodgins has found decorative marble chips in the victim's shoes. They are used in landscaping, and are not rare, but the victim was probably walking around on them before he died. Cam thinks the victim was in a struggle before he died, as there are two incisions in his right forearm. Hodgins points out that he did go through a windscreen, but there's no glass in the wounds. Aubrey and Booth are heading to the set of the film. Booth mentions creative types and Aubrey replies that he heard the guy who played Agent Andy is in rehab. As they approach, someone shouts action. There still seems to be a director. Who was apparently the sandwich boy yesterday. There are girls in swimsuits being chased by people wearing brightly-coloured fuzzy costumes. Booth comments that it's like spring break on bath salts. One of the fuzzy things is supposedly eating one of the girls. This is not Citizen Kane. It's not even Citizen Crane. The FBI - Are They New? Oh, that FBI! Bummer, I thought you guys were, like, Hollywood agents, real agents. The film's new director, Kirby, when asked for the film's title, says he thought they were supposed to know this sort of thing. It's Radioactive Party Panthers from Fort Lauderdale. 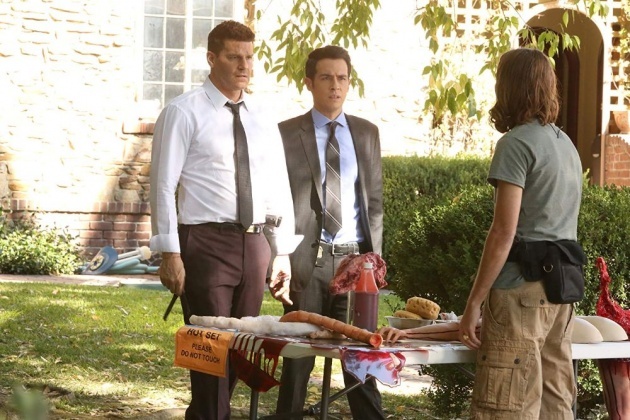 He asks Booth and Aubrey who they are with again. When they reply the FBI, he says he has never heard of them. Are they new? When Federal Bureau of Investigation is spelled out to him. Kirby goes oh, that FBI. Kirby thought they were Hollywood agents. You know, real ones. Kirby is told that Bergman is dead and he replies that explains why he couldn't get hold of him this morning. He may have been the sandwich boy, but he's been to film school and he knows how this works, and that he is a suspect. Kirby says he didn't need to kill Ron to get control, as Ron was already giving him plenty of control. It also turns out that Ron shot as much footage as he could get cameras to shoot. So that footage needs looking at. Wendell is talking to Brennan about the titles of terrible films. She hasn't even heard of Sharknado. Brennan replies that all those films are scientifically implausible. Wendell thinks that's the appeal of B-movies; they are a mindless escape. Brennan asks if people actually enjoy things that don't require them to think. Wendell asks that after a long day of work, if she doesn't want to just turn it off. This is Brennan; the answer is no. Wendell is still struggling with his dissertation, so Brennan asks if he wants to read her unpublished ones. The answer is yes. Angela is still piecing together the mobile phone when Cam says she has lots of film footage to go through. Hodgins volunteers - well, begs - to be the one to go through it. Apparently he really likes B-movies. Especially the ones where people are eaten by giant bugs. 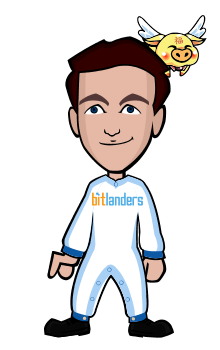 This footage leads to David Faustino (as himself), the film's big star who played Bud Bundy on Married with Children. He also is seen getting really angry with the director, and has a history of attacking them. Ron was also clawed by a panther that was on-set, and the trainer spent five years in prison after a bear nearly killed another actor. If that happened again, well, it would be bad for him. There seem to be a whole bunch of people with viable motives. Then it also turns out that the film being shot is not remotely close to the script that Bergman started with. A million dollars has been poured into something that is absolutely awful. The original film sounds like it might actually have been good. Some things Brennan says suggest that she might no longer have quite then enthusiasm for the job that she used to have. Given that there are only two episodes left after this one, is this foreshadowing?